Local panchayat authorities of Rajabari village under Titabor Block of Jorhat, Assam paid no heed to repeated written & verbal requests of the Uraon (Adivasi) people from Rajabari village to construct a mere 140 m road that connects the Thaan (place of worship for indigenous faith) from the main road. Thaan is an integral part of the Uraon community that seeks blessings of their indigenous God. Our Thaan was in a bad shape, especially during the rains & it was almost impossible for us, especially women & children to make it to the place (Thaan) for prayers said Bepin Tirkey of Rajabari village. We were never united before & had lacked oneness among us said Mr. Raju Uraon from Rajabari. The community not being united towards their cause in the initial stages had to face a lot of challenges. It looked like that the question of religious belief & well being of their fellow community finally brought the people together. But the struggle was not over yet. Endless written & verbal request to the authorities prove futile. We almost lost our hearts when all the doors for help & support from the Government were closed in spite of several representations since last two years said Mr.Raju Uraon from Rajabari village. He further said we finally resolved to start of our own & that would be the best tribute & homage to our God. 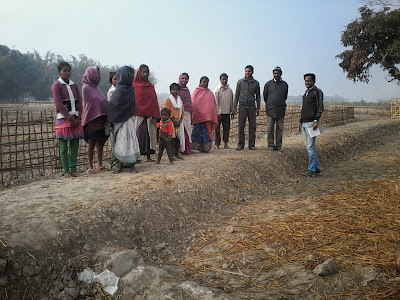 The Project Team of FARM Northeast meanwhile put in all possible efforts behind the people by trying to motivate them. The community began to work on a shift basis in the construction of the approach road & community hall from 18 December 2014. The community involved equal participation of women as well. The labour was divided among the men & women in a manner that did not disturb their day to day activities. Our men would work from the wee hours of morning upto 8.30 am & then they would go to their fields, while we would finish up all the chores in the household by 9.00 am & then work until lunch & even thereafter said Ms. Sony Oraon. She also added that men would also contribute labour once they returned from their fields until it gets dark in the evening. It was a matter of about one and half month when we saw our hard work bearing results & by 30th January 2015 the approach road & community hall respectively was not only ready but operational as well said Bipen Tirkey. Today, we feel proud to have been able to restore the approach road & construct the community hall as we are for the preservation of our rich culture & heritage said Mr. Bepin Tirkey. The community of Rajabari village were thus able to bring a change in the society & have also become an inspiration for a lot of others in the area nearby. Today one can see a well constructed approach road & a community hall standing tall in the village.